Physicists from the Russian Academy of Sciences claim to have made the first detection of water dimers in realistic atmospheric conditions. Water vapour is the third most common gas in the Earth's atmosphere, and it plays a key role in radiative exchange process, by acting as the principal absorber of both sunlight and blackbody radiation. It has been known for decades that there is a discrepancy between established theoretical models of this radiative balance and observations of atmospheric temperatures. It seems that water vapour can absorb even more radiation than predicted by the models. 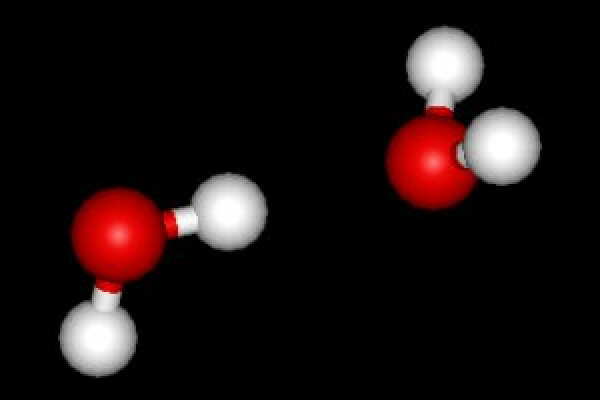 One explanation for this discrepancy was offered in the 1960's by Sergei Zhevakin - he demonstrated that hydrogen-bonded pairs (dimers) of water molecules would be much stronger absorbers than single water molecules (monomers), and that a mixture of >99% water monomers and <1% dimers would rebalance the atmospheric equations. The search to find evidence for the existence of these dimers has been on-going ever since, with many successes detecting dimers at temperatures near absolute zero. The main challenge with detecting dimers at higher temperatures is the weakness of their infrared signatures - it is very difficult to separate the vibrational signal of a dimer from that of the dominant single water molecules. The Russian team have looked at an alternative signature - the rotational spectra of water dimers - a four peak "spectral fingerprint" which can be detected at room temperature. The team have built a highly sensitive spectrometer that can measure the absorption of millimetre-wave radiation in water vapour, thus detecting the rotational spectra of water dimers. Their spectrometer uses a resonator - a vapour-filled cavity with mirrors at either end. By adjusting the mirrors, specific (resonant) frequencies of light can be selected, and the sharpness of the resonant peak depends on how this light is absorbed by the vapour in the cavity. In this way, this instrument can 'map' the absorption of water vapour, measuring any peaks in the millimetre-wave region. Mikhail Tretyakov, a lead author on this paper, has been developing this spectrometer for a decade. He states that the sensitivity of the instrument is an order of magnitude higher than anything that has gone before - the team have used their spectrometer to detect the rotational spectrum of water dimers at 23 °C and at 0.017 atm. This is the first detection of water dimers under representative atmospheric conditions. But there are still some unanswered questions in the paper - the observed dimer peaks are four times broader than predicted, and authors argue that this is due to some asymmetry in the dimer not predicted by models. There is still some debate around the validity of this conclusion, but regardless, the consensus is that this work represents a big step towards directly measuring the abundance of dimers in the atmosphere and may help scientists in many fields gain a better understanding of how their presence affects climate. Why does cooled water sometimes suddenly freeze? Every cloud has a silver lining, or should that be a lead lining?